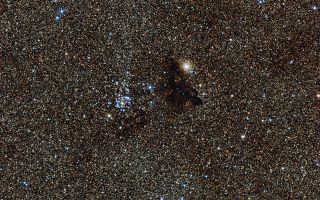 This cool space wallpaper from the Wide Field Imager on the MPG/ESO 2.2-metre telescope at ESO’s La Silla Observatory in Chile, shows the bright star cluster NGC 6520 and its neighbor, the strangely shaped dark cloud Barnard 86. This cool space wallpaper from the Wide Field Imager on the MPG/ESO 2.2-metre telescope at ESO’s La Silla Observatory in Chile, shows the bright star cluster NGC 6520 and its neighbor, the strangely shaped dark cloud Barnard 86. This cosmic pair is set against millions of glowing stars from the brightest part of the Milky Way — a region so dense with stars that barely any dark sky is seen across the picture.